Featuring 5-layer GORE-TEX® fabric that is “25 percent more breathable than anything on the market,” the 2013 Simms G4Z ($799.95 ) and G4 Pro waders ratchet up the performance index on fly fishing waders for 2013. The company sent MidCurrent the info on new products today as it prepares for this week’s ICAST show in Orlando, Florida, which starts Wednesday. 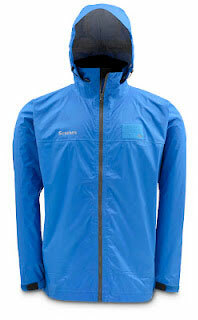 Also included in the new Simms products announced for 2013 are new Contender GORE-TEX® jacket and bibs. Close descendants of the award-wining ProDry® GORE-TEX® rain suit that was perfected (and now used extensively) on professional angling circuits, the 3-layer GORE-TEX® Performance Shell Contender products are 100% waterproof, windproof, lightweight, durable and breathable. 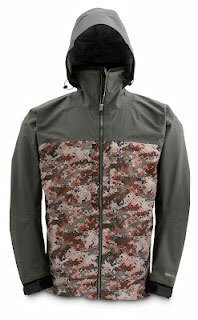 Designed to provide long-lasting performance in a wide range of conditions, the Contender jacket has a MSRP of $349.95 and the bibs come in at $299.95. The company’s new Hyalite Rain Shell ($149.95) will weigh less than 14 ounces and is intended for storing in a backpack, under the bow or even under the seat of the truck. And building upon its relationship with the Skin Cancer Foundation, Simms is debuting a number of new sportswear items with a UPF rating of 30 or higher. The new Guide Pant, for instance, has a UPF 50 rating and the eye-catching Morada shirts ($59.95 long sleeve and $49.95 short sleeve) check in with a UPF 30. As usual the company will offer a bunch of annual additions to its women’s line and accessory products, with new shirts and pants, new vests, new colors in Sungaiters™, several new caps and new accessories including a tarpon bottle opener and wading belt.